Case Lot Extravaganza: How I case lot shop and the best $400 Investment you will ever make! You’re probably getting tired of me talking about the case lot sales going on right now, but I can’t help myself! I want EACH and EVERY one of you (who live in the Midwest and Western U.S) to take advantage of these deals. Before these deals end on Monday, I just wanted to send out one more reminder to hopefully get you to take the time to do some grocery shopping this weekend. I know it can be hard to find time to do this kind of shopping, but I promise, it will bring you peace of mind–as well as save you $100’s for months to come. It is imperative that before you go and do a large grocery shopping trip that you know what you have. Many times we think we know what we have on hand, but until we take the time to take inventory, our memory might not be as accurate as once thought. For example, I took inventory yesterday before going out shopping and realized I have WAY more of certain items that our family needs. If I had gone shopping, I might have bought even more of those items and perhaps wasted money by letting things expire before we used them. We have an awesome Inventory Sheet if you would like to use. It works like a checkbook (totals on the gray lines and current amounts on the white lines). 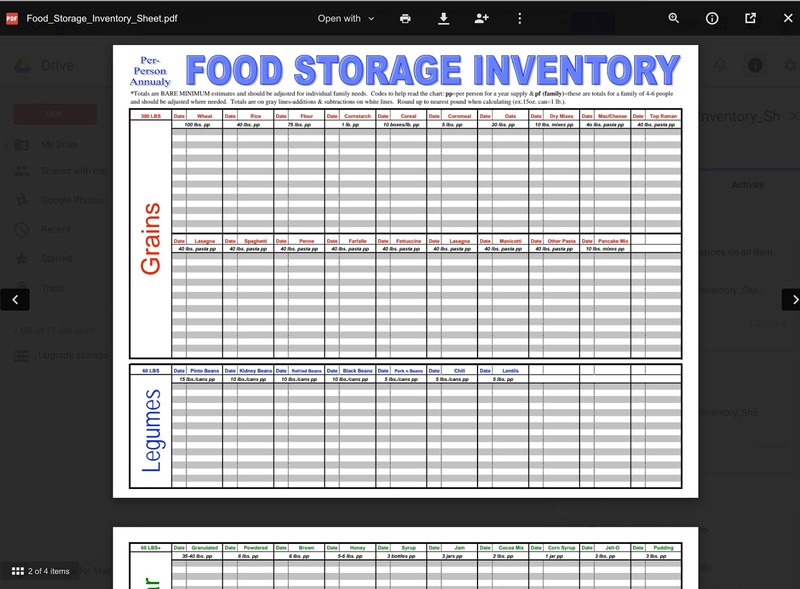 This sheet is great to also give you an idea of which items you need to add to your storage and how much of each item. Before you go shopping, it is important you have a plan for your shopping trip. 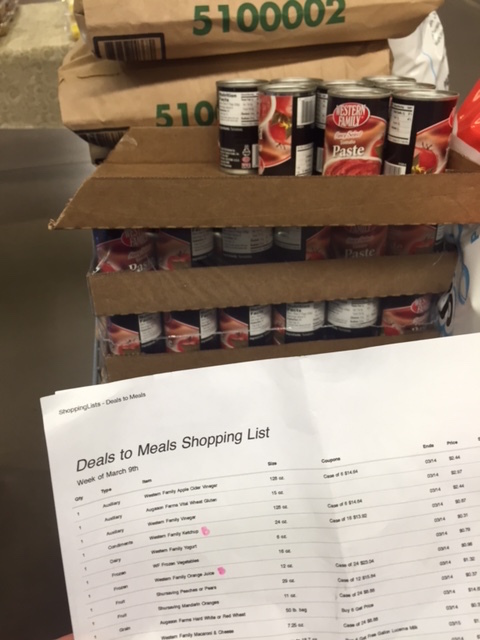 Use Deals to Meals to know which store (or stores) has the best deals you are in need of. You can always shop at the one or two stores, or you can price match all of the best deals at your local Walmart. When I do my large case lot shopping, I always like to shop at the actual stores having the sales. They seem to have a greater supply and I like buying the cases all wrapped up together. The two stores this week with the best case lot deals are Maceys (www.maceys.com) and Ridleys (www.shopridleys.com). Both have awesome deals this week!! 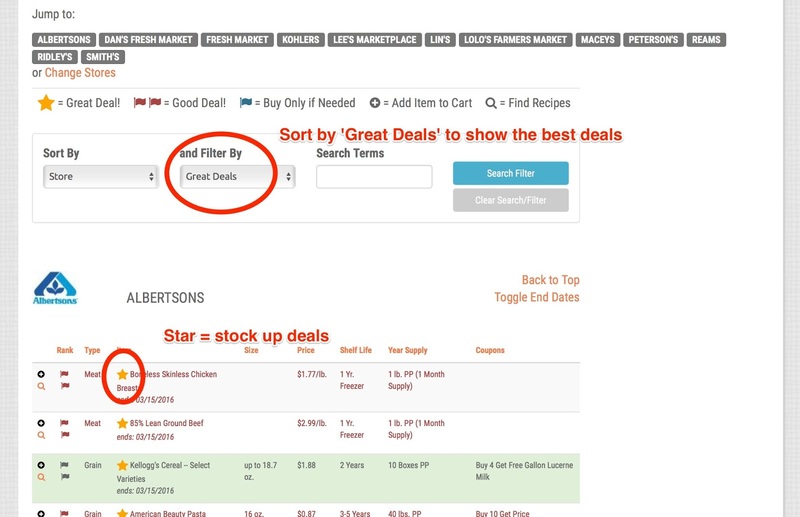 To find the best deals, just login to Deals to Meals and search for the ‘best’ deals in your area. Look through the list of best deals and click on them to add them to your shopping cart. Once you have your list, you are ready to go shop! 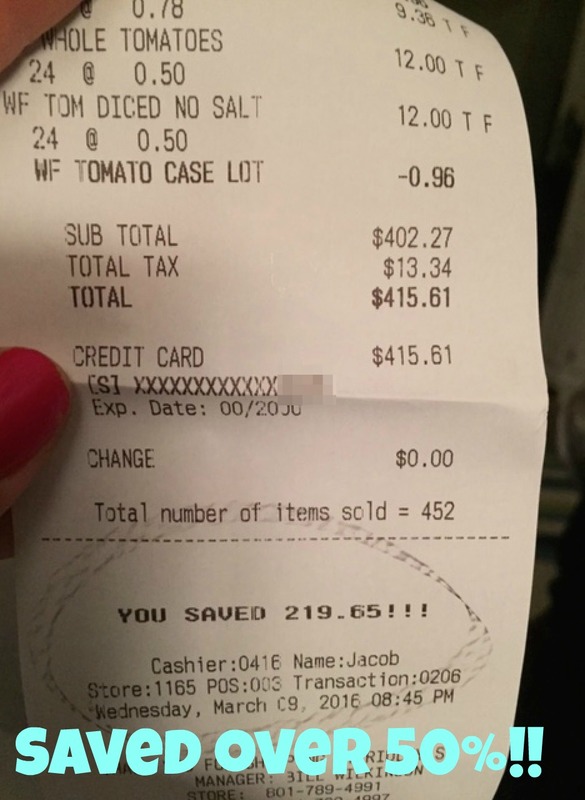 The key to save the most money on your groceries is to buy as much of those great/best deals as you can afford. When items are on sale for their lowest prices, it’s the best time to stock up to save you money in the long run. 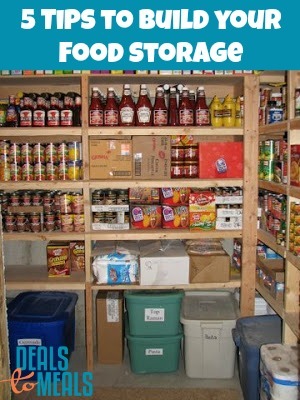 For example, if your family uses canned beans on a regular basis, then stock up and buy several cases. Don’t buy just one–buy cases if you can afford it. These items won’t go on sale again for 6-12 months–so stock up! If you can buy several now, you won’t have to buy those items again at regular prices for the rest of the year–saving you $100’s throughout the months to come. There are few investments that bring as much peace of mind, than knowing you have enough money and food for a ‘rainy day’. We never know what our future holds. We may experience job loss, natural disasters, health problems, etc. No matter what the situation is, we will always be grateful to have enough food, water and money on hand to help our family weather the storms of life. How often do we pay monthly for life insurance, car insurance, cell phones, gym memberships, etc.– all for our comfort and peace of mind? However, how often do we think about what would happen if we were unable to go to the store, or have money to buy our family the necessities of life? 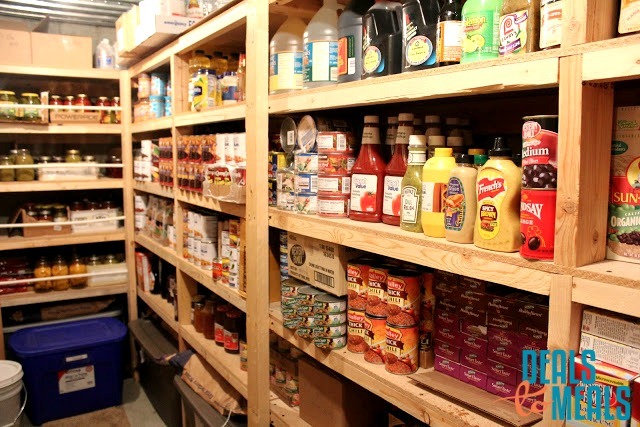 Having a well stocked food storage and pantry help bring us a peace of mind we can’t get in any other way. There are few things in life we can purchase that will bring us as much sense of peace. Did I spend over $400 this week on food storage? Yes. Was that a stretch for my family? Yes. However, knowing we have nearly all of the basics our family needs (and will use) for the next 3-6 months, brings me a lot of comfort. Not to mention, it saves me time and money by not having to go to the store as often, and buy items when they aren’t on sale. So many times we make excuses as to why we don’t have time to be prepared and get our lives in order. The time to make excuses is over. With our economy the way it is, I urge ALL families to take a few minutes and figure out a plan for your family. What is your plan during an emergency? How will you cook your food if you no longer have power? 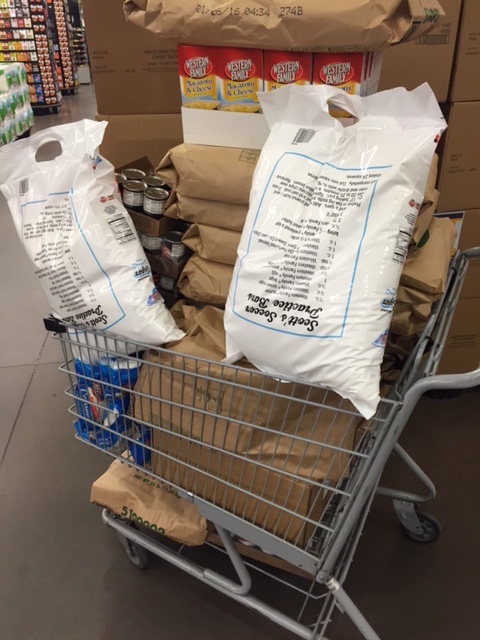 Do you have enough food and water to keep your family eating comfortable for 1, 2, 6 weeks to come? Think about these different scenarios and DON’T DELAY! Take one step now and then work on another portion of your preparedness plans in the future. If you haven’t started stocking up on anything, then start with water. 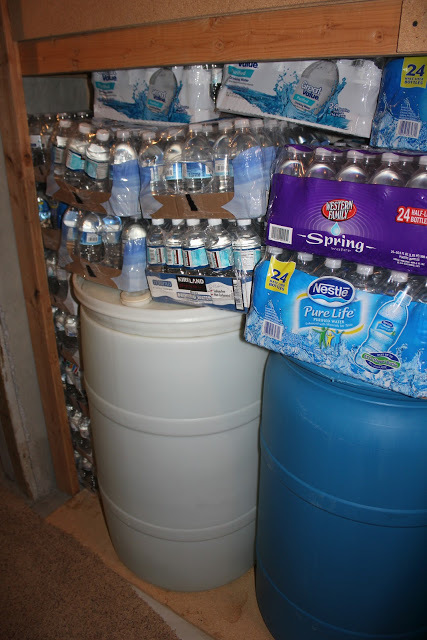 Water is one of the most important aspects of your food storage and emergency preparedness efforts. 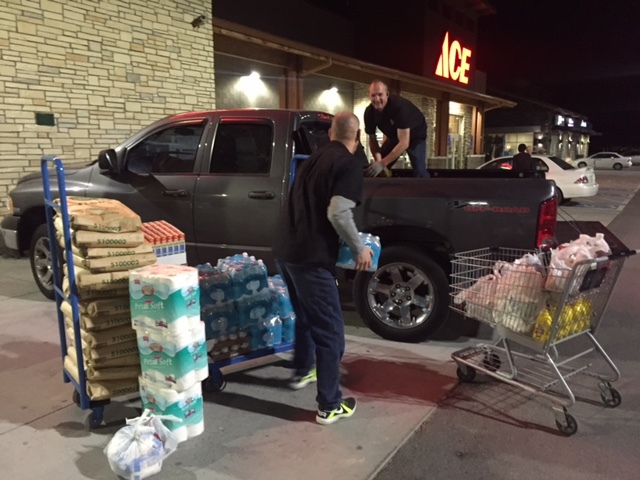 If you don’t have anything on hand, start with buying several cases of water. You need a 2 week supply of water per person in case of an emergency. That is about 2-3 (24 bottles) per person. These are on sale this week, so it’s a great time to build up your supply of water. For my family of 7, our 2 week supply of water would cost under $50. That’s not a bad investment when you consider the peace of mind that purchase would give. Thanks for the inspiration – I needed this post! We are in the process of finishing our storage room in the basement, so everything is all haphazardly stacked down there, and I don't know what I've got. I printed out the inventory form, and am excited to use it to get organized! Then I'm going to go hit the case lot sales! Thanks so much! Nice way to collect cash. Thanks for this inspiration. Great Tips..Thanks for the pretty share. You can buy Go Kart Parts directly here.